Despite its sleazy location in Orchard Towers, Thai Tantric is perpetually packed. People who work in the vicinity seek solace in the comfort food, while people like us would travel just for a reliable Thai meal. The prices here may appear to be slightly more – S$6 for rice and noodle dishes, and S$10 for meat and seafood – than other Thai eateries in Singapore, but the bigger portions more than make up for it. Whatever it is, if you haven’t been, it is time to head down. You can’t beat the Green Curry Chicken (S$10) at Thai Tantric. We’ve had it on numerous occasions, and they were always thick and flavourful, with generous chunks of chicken. Need your soup? Yes, you shall have it. The Tom Yum Seafood (S$10) is consistently good. But if your tolerance for spicy food is low, this might be a bit too fiery for your liking. We loved it though, that it was always milky and kickass with strong hints of lemongrass. The Steamed Seabass in Thai Sauce (market price, we paid S$35) is such a star that this on its own is worth a visit. It may not exactly be affordable, but it is worth every penny. 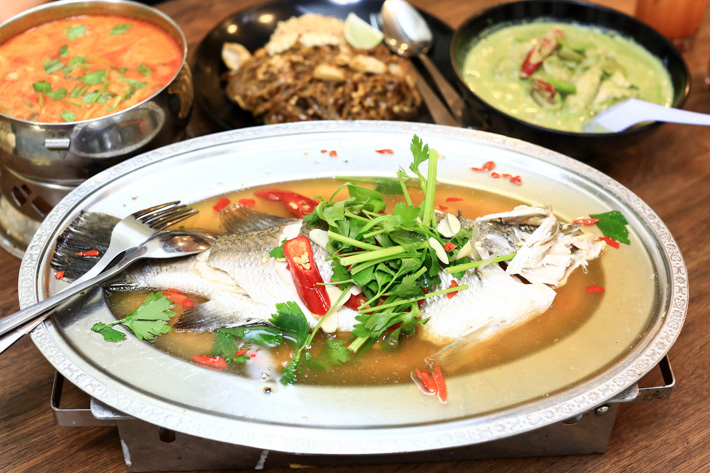 Fresh white-flesh fish that is soaked in a spicy and tangy sauce; totally hits all the right spots. 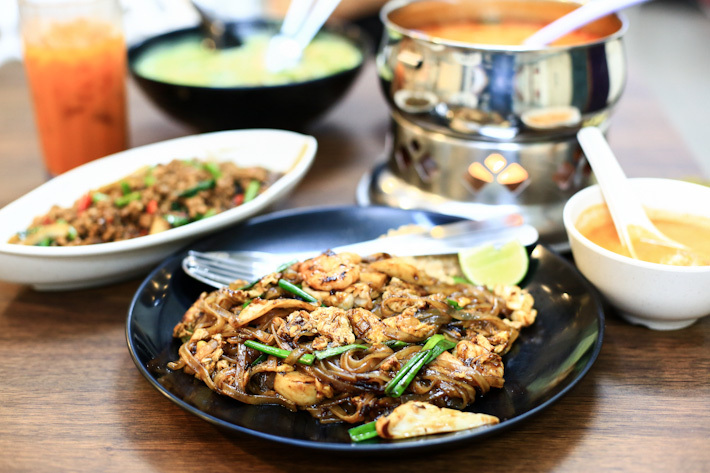 You can come here for a simple lunch and get a one-dish meal and a glass of Thai iced tea, or gather a group of friends and order many Thai classic dishes to share. That’s what we like to do – party over a table full of Thai dishes! Something that you should avoid when in Thai Tantric is the Pad Thai (S$6). You might think that a Thai eatery won’t get this classic dish wrong, but we tried it twice and it was completely unimpressive. Don’t waste your money and calories. The Pineapple Fried Rice with Floss, on the other hand, was much better than expected. We’d choose this over the Pad Thai anytime. Just a word of caution: Orchard Towers is probably not the safest place for girls to visit alone. So make sure you have a guy among your company, or just go with a big group of friends. Hi there, thanks so much for your article! I was wondering if you knew about whether Thai Tantric is still at its original location at Orchard Towers. Do you know anything about it? A quick check on Google showed that it has closed down but I can’t seem to find any info on when and if they’ve moved. Hey Gwen, not sure whether you’ll see this, but it’s still there! I have lunch there quite regularly with my colleagues.